At the very least, excess celebration and etiquette mistakes at the company holiday party can become fodder for next day stories and eventually office legend for future parties. And, according to industry surveys, about 15 percent of those companies that have hosted holiday parties say that inappropriate employee behavior at holiday parties in the past has impacted an individual's career growth in the company. Party Scenario: A crowded room full of well-dressed people, the uncounted number of drink in your hand, you’re laughing, the contents of the glass begin splashing, and you continue laughing. This is probably the most common mistake that some employees and managers make during the year-end holiday celebration. While many organizations are still offering a full bar, others have begun limiting how much alcohol will be served at the event. Regardless of the company’s decision, it highlights that nobody should over-consume. Limit drinks with alcohol to a maximum of two. Drink coffee, tea, soft drinks, and water. Party Scenario: Excess grease leftover from a recent spicy chicken wing partially on the napkin stuffed in your pocket - next to the rolled up cocktail meatball napkin - and partially on your free hand (the other hand is wet from a drink). One of the bosses walks up to you, ready to be greeted. People who attend events understand that food and beverage will be part of the experience. But it's important to be considerate of how others will approach you, and that includes etiquette basics, such as maintaining clean hands and avoiding a mouth full of passed canopies. Do not walk around with multiple hors d'oeuvres. Do not double dip or return buffet food. Properly discard napkins, toothpicks, etc. Party Scenario: You meet the Sr. VP of your division for the first time at the party and share a 15-minute, detailed story about the office move from six months ago. Most people gravitate and spend time with their colleagues and direct managers. However, try to make an effort to speak informally with as many people at the event as possible. That means limiting the time anyone spends with any single individual or group of guests. Executives enjoy speaking with employees, and for many, this may be the only interaction. Also, avoid appearing bored by others in attendance. Limit conversations to 5 minutes. Avoid in-depth discussions about business. Thank party hosts and organizers. Party Scenario: You're still talking with that Sr. VP about the move, but now you're explaining how it causes an extra 8 minutes to your commute. In addition to keeping conversations brief, event guests should also remember that this is meant to be a time when everyone can celebrate the successes of the year. That means a cheerful mood. Remember, stories are often heard by others who are nearby, and those people will add their own spin to the story. A stray comment can quickly be taken out of context and become this year's rumor mill, and your name is on it. Identify safe topics to share before the event. Switch topics if you or someone else begins to complain. Party Scenario: You discreetly arrive about 55 minutes into the program, circle the room quickly to be seen, speak to the boss, speak to a colleague, speak to a counterpart in another department, and disappear 23 minutes later without anyone noticing. Know this: attendance at the annual company holiday party is practically mandatory. Fashionably late is not fine; arrive in the first 30 minutes if possible. Everyone remembers who stayed for just 10 minutes or departed early. Senior managers should make a point of staying as long as possible. That means if you're not there when the event begins, certainly stay until the event ends. Employees should also be mindful of how long they stay at the party. Party Scenario: In preparation for the company event, a few ladies may choose that form fitting, low cut, sequin dress and highly fragrant new perfume. For a few men, they may think it's the ideal time to show off that shiny suit (which should never have been worn) ... and, oh yea, that strong, new cologne. Pay attention to the attire description listed on the event invitation. This may be a holiday party, but it's being attended by your coworkers, not personal friends and family. Please try to avoid these five holiday fashion mistakes. Party Scenario: The company excluded personal guests for the first time this year, but your spouse happens to be great friends with most of your colleagues and knows many of the bosses. You decide to bring him or her with you because several people in your department agreed it was a good idea. Some organizations allow additional guests, but many do not. Remember that this is an officially sponsored company event. All of the planning decisions have already been carefully weighed, and many legitimate reasons exist behind such decisions, including the accounting of expenses. If guests are excluded on the invitation, schedule a different party with your friends and family members, and leave them at home this year. Excessive Personal Time with Another Coworker. 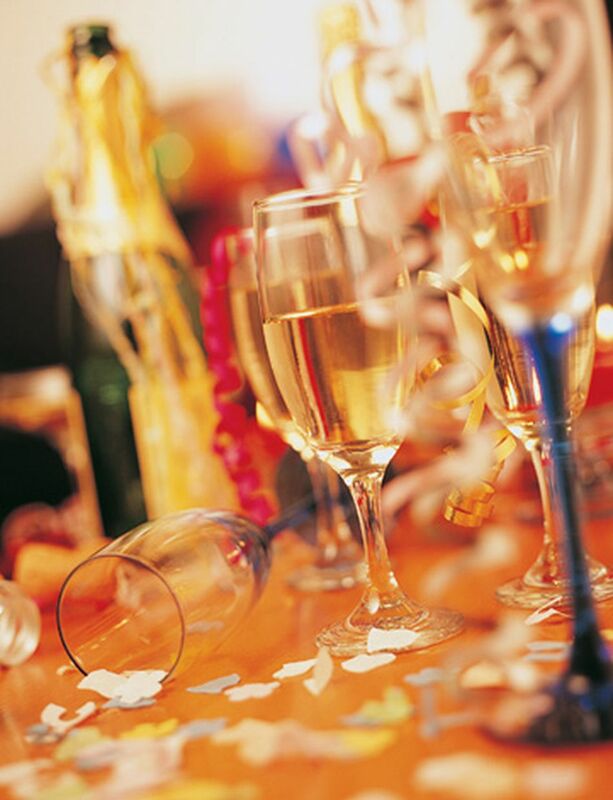 Party Scenario: You stay for the duration of the party and join other colleagues elsewhere for drinks after it ends. You may have indulged just to the point where you may be feeling a little less inhibited than a couple hours earlier. And then you act on what may not be the best decision of the day: you head back to the office with another co-worker. Remember this: in most offices, security cameras are frequently placed where you may not realize, including hallways, stairwells, etc. Many organizations take different views on personal relationships among employees and managers. And, at the very least, everyone will definitely know about personal encounters at the office and elsewhere -- long after the party is over.